This very handsome, 22-story, beige-brick pre-war apartment tower at 666 West End Avenue has 403 rental apartments. It was erected in 1927 and designed by Schwartz & Gross. The building, which is known as the Windemere, has a three-story, rusticated limestone base, a concierge, some balconies and terraces, a canopied entrance, nice terracotta decorative façade elements, consistent fenestration, and protruding air-conditioners. It has a two-story arched entrance surround. The building has no health club, no sidewalk landscaping, no garage and no roof deck. It is one block away from Riverside Park and is along one of the nicest stretches of this fine residential avenue. There is excellent local shopping nearby on Broadway where there is also good public transportation. The building is U-shaped in plan with a large courtyard opening to the north. The building, which is also known as 257-167 West 92nd Street, is one of the tallest on West End Avenue. The first set of setbacks is at the 15th floor where three center bays flanked by terracotta quoins maintain the building line while the end bays are recessed behind stone posts with wrought-iron railings. Another setback is at the 17th floor and the center bays of the 19th and 20th floors are flanked by terra-cotta cartouches and paired pilasters topped by a broken pediment with an urn. The top two floors are setback and enhanced by brickwork in geometric patterns.The building was erected on the site of five brick-faced rowhouses on West End Avenue and one on West 92nd Street and its name comes from Lake Windemere in the Lake District of northern England. On July 16, 2010, Adam Pincus wrote an article at therealdeal.com that this building was brought by Laurence Gluck and Moshe Azogui for $72 million. 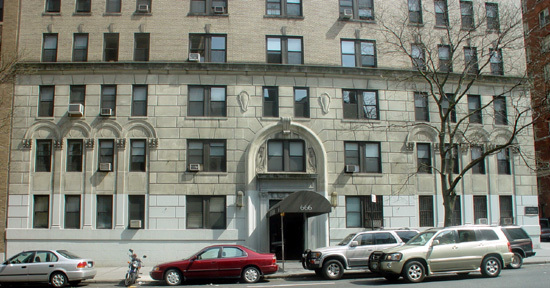 The article said that the 1927 building "is a single-room occupancy apartment building, city Department of Buildings records show," adding that "insiders were surprised that Gluck could get financing since he lost Riverton Houses in Harlem in a foreclosure and is a facing a $110 million foreclosure suit at the Financial District office tower at 2 Rector Street." "Nationally," the article continued, Mr. Gluck's Stella Management company, "announed in May that it would default on its $550 million first mortgage on a 3,221-unit apartment complex in San Francisco called Parkmerced, which is due in October....In New Yhork, Gluck has been criticized for his management of apartment buildings. But now, if troubled 33-story affordable rental building Tivoli Towers in Crown Heights remains in the Mitchell-Lama program for 30 years, the city will give its blessing for Gluck to buy it, a spokesman from the city's Housing Preservation and Development said.